Today my wife Anushik attended a protest held opposing the plans for a massive copper mining project. It was held in front of the Government Building on Republic Square in late morning, then the protesters marched to the Presidential Palace. I covered the controversy surrounding this project in my two previous posts, so read them for more details. An estimated 608 hectares of precious land in Syunik is slated to be turned into a massive open mining pit so that a handful of government officials can make countless millions at the expense of Armenia’s long-term environmental sustainability. But not if these activists can help it. This video depicts a confrontation between environmental activists and Syunik governor Surik Khachatryan in Kajaran (the video is in Armenian). Basically they are saying what I wrote in my previous post, emphasizing that the extracted copper and the profits associated with its sale on the market will go to Germany, where the parent mining company is based, and that the Armenia economy as well as the countless village inhabitants that will be displaced, won’t reap any benefit from the mining. The woman wearing the hat is the maverick Mariam Sukhudyan, but unfortunately I cannot identify the man in the camouflage jacket. Mariam is certainly an inspirational woman and she is the single most effective spokesman for badly needed change in this country — change in the mindset and the corrupted values fostered by so many politicians here. Towards the end of the video he called her a dragonfly and purportedly said that something “bad” would happen to her if she continued her protest (it was not audible but appeared in print). Her continued efforts (as well as those of her teammates) will undoubtedly spark a fire in the hearts of many Armenians to stand up for themselves. It’s just a question of when. One thing is certain for many people not just in Syunik but in the minds of many here in Yerevan — this guy has to go and this project must be stopped. He can barely defend himself and can’t even speak proper Armenian. Being born in the States I was not educated in Armenia and mostly self-taught in the language, yet it seems I can speak better Armenian than he can. The video is testament to how utterly uneducated Khachatryan and undoubedly many other people in government are. Kudos to these brave activists. May their crucial work continue unabated. Reading yesterday’s headlines I came across a major news story of a Kajaran mayor in Syunik, Rafik Atayan, resigning from his position and from the Republican party in protest to the government’s decision to confiscate 181 hectares of land in the area. The land will be turned over to the German-owned mining company, Zangezur Copper-Molybdenum Combine (ZCMC). The lands will become an “open-pit mine,” meaning that all the dust created in the excavation process will drift and pollute the surrounding areas. Water supplies and agricultural lands will be ruined as well. The Armenian MP living the village, a former executive of the mining company, is obstinately indifferent. The mayor’s protest is admirable but will ultimately prove nothing since his replacement will obligatorily sign the paperwork formalizing the new mining initiative. Land has already been given to the Chinese in Syunik in a different government-backed plan, ironically nit to far from Tatev, which was anticipated to be Armenia’s top tourist attraction when it opened just over a year ago. There are still other controversial projects that are stalled or about to get underway in Teghut and Hrazdan. The German group [Cronimet, the parent company] insisted that the planned expansion of the ZCMC’s mining operations stems from “a number of agreements” with the Armenian government. That will also boost Armenian exports and “economic stability in the country, it said. These types of statements have become totally laughable and even insulting. The monthly minimum wage in Armenia is absurdly low at 32,500 dram ($83) and a bill introduced by the ARF last month to nearly double it was shot down by the Republican controlled National Assembly. In other words, most people in Armenia — factory or mining workers being no exception — live hand to mouth. Most people can’t save up and have little or no pocket money to spend to benefit the economy. ZCMC prides itself as supposedly being the top tax paying corporate institution in Armenia (untold sums of collected taxes are, in turn, eaten), but that doesn’t mean government officials will not reap the benefits of kickbacks from profits. The money made in this deal (and others) will not be vested in the Armenian economy realistically simply because it will end up in several peoples’ pockets and foreign bank accounts instead at the expense of Armenia’s fragile environment. That’s the way things work in capitalist Armenia. So let’s stop kidding ourselves that high exports in metals are good for the economy. When rural areas are still underdeveloped in and around Armenia, with some new settlements in Armenian-controlled territories doing without roads, running water and electricity as I wrote in a previous post, these statements from government officials are paradoxical. Mining businesses benefit the elite, while the rest of the country’s potential along with its ecological longevity suffer. I just wanted to make yet another point that when a collective group of individuals campaigning for the same cause protest hard enough, their demands will eventually be met, sooner or later. In Nareg Hartounian’s case it only took a few days. At last count 1,251 people signed the online petition demanding his release from jail, and the “Free Nareg” Facebook page received 1,624 “likes,” with 2,041 users discussing the issue. Although the Ministry of Diaspora declined to comment on Nareg’s arrest, Minster Hranoush Hakobyan undoubtedly received myriad complaints. We know that he and his associates were released per the order of an official in the Prosecutor General’s office, but it’s still unclear what additional pressure was placed on the authorities to free Nareg from jail, not that it matters much at this point. Kudos to the activists tirelessly pushing for Nareg’s freedom from incarceration. Now we can only hope that the the controversial, on the surface incredulous, tax evasion case he is embroiled in will be resolved without additional drama. I just read a poignant photo essay about the maternity drive in Nagorno-Karabagh published by the New York Times called The National Womb. The NK government is encouraging young families to have babies by giving them incremental sums of money for each additional child they rear. After the sixth child has been born the family is given a home. Unfortunately there is no other way to keep the population there somewhat steady. 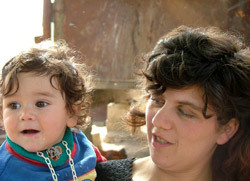 As in Armenia, the youth are emigrating in search of better opportunities elsewhere. Lucrative business ventures to employ people are few there. 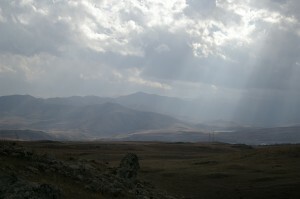 I was in Nagorno-Karabagh in July and couldn’t help but notice that areas of the countryside seemed bare of residents. The capital Stepanakert is a lively city but Shushi, which is far more picturesque, still seems neglected, despite all the work being done there to repair the infrastructure and open new hotels to attract visitors. The entire region needs settlers and money so that society can advance. Compared with Armenia corruption is apparently very low, so I don’t understand why the willingness to invest in Nagorno-Karabagh more aggressively is not there. Perhaps daily flights between Yerevan and Stepanakert, hopefully to start next year, will entice that much-needed investment. In the meantime, many babies are needed. But the question as to whether the parents of those families will be able to consistently provide remains to be answered. Incidentally, I wanted to mention an excellent article published by Hetq last June called On That Side of the World about life in Kashatagh, where there are no normal roads or even electricity, and where Armenians who sacrificed life in civilization choose to survive. I cannot imagine living without electricity and I don’t understand how they do it. The heartbreaking thing is that no one cares, not the governments of Armenia or Nagorno-Karabagh, and not the Armenian Diaspora. They just linger there, waiting for someone to pay attention to them, waiting for something to change that never does.